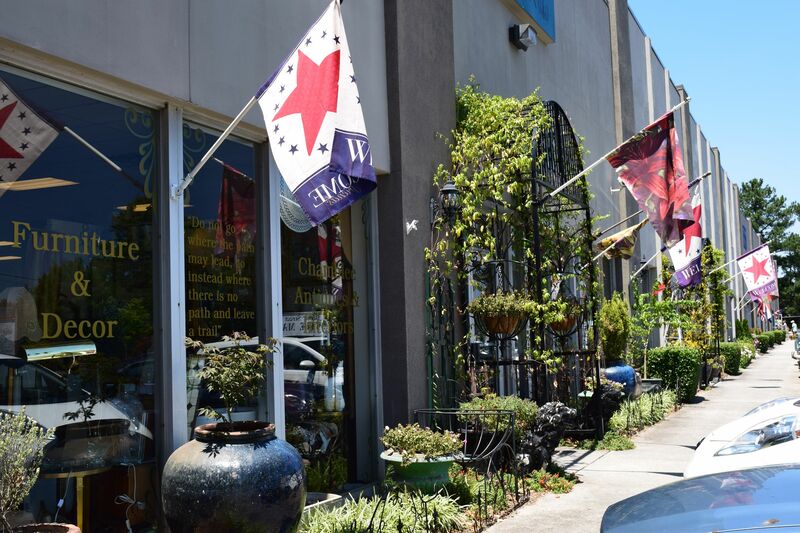 A prolonged car ride took us to the Chamblee Antique Row yesterday. 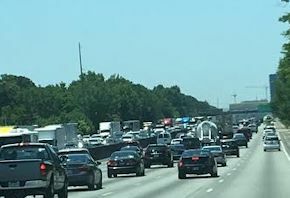 Traffic is always bad in Atlanta these days. What would have been about a 50 minute car ride was almost double, but we prevailed. 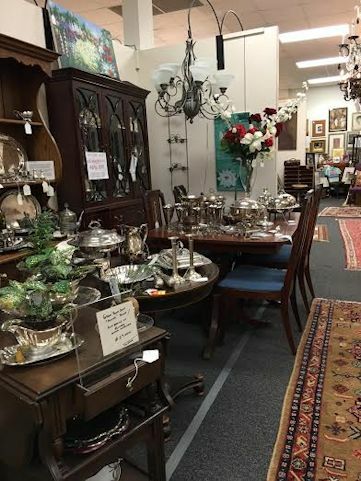 There are quite a few places to shop for antique treasures in this area. 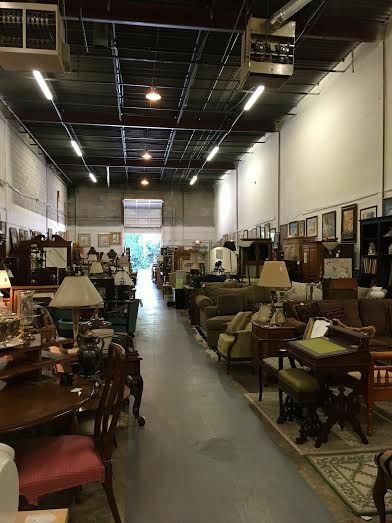 We settled on a 100,000 square foot antiques mall. I peeled the backs of my legs off the leather seats and made a dash across the 94 degree parking lot temperatures into the cool interior. Forget that I just lost 2 layers of skin. There was shopping ahead of us! What awaited me was EVERYTHING. I can’t even think of anything or any category that wasn’t represented. 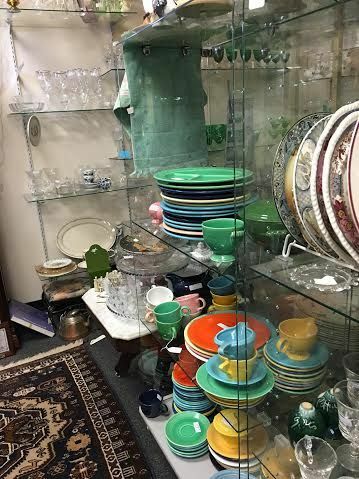 To me, the prices were high but I am mostly used to local garage sales and flea markets rather than antique stores, so the prices may have been more reasonable than I give them credit for being. I took a few pictures of a few of my favorite things but we would be here all day if I had taken photos that represented all of the collections. Loved the robots. 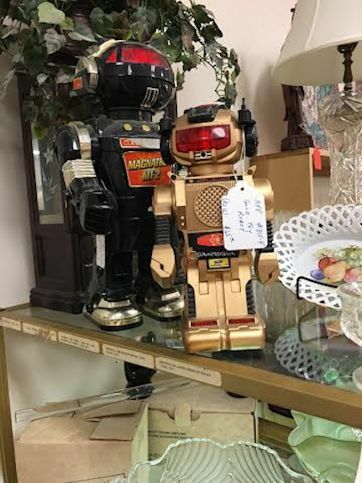 It cracks me up with the irony of antique robots. A bit of an oxymoron, really. There was plenty of furniture. Some antique, some consigned. And cases and cases of knick knacks and jewelry. 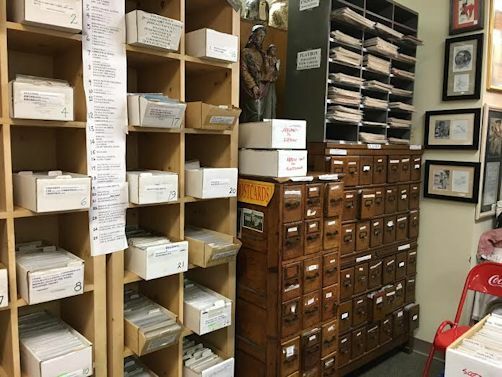 One vendor has an enormous collection of vintage post cards. 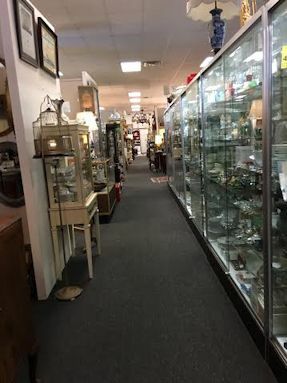 There were also a few thrift stores mixed in with the antique stores. 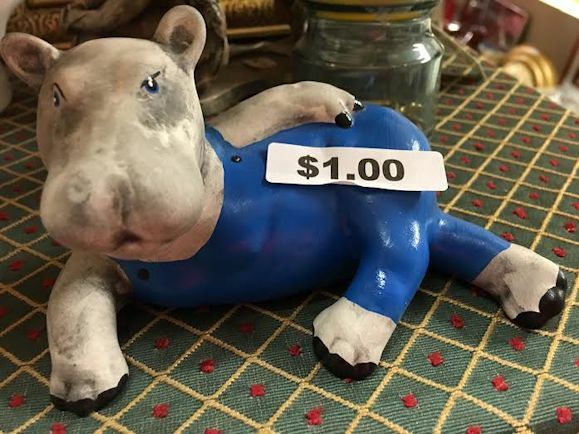 For just a dollar I could have had this jolly fellow. I purchased one small dish at the thrift store which I will clean up up and show you in a future post. It was originally priced at $3.00 but yesterday was Spin-and-Win day and I got 20% off my highest priced item. Score! The most reasonable item we had today was a fish sandwich meal at McDonalds. There was a $1 off deal so we grabbed it! 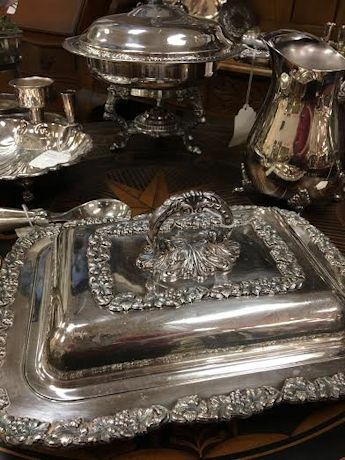 MA, Kate and I hit several antique malls in Fredericksburg, Texas last month…as usual, saw lots and lots of goodies. That would be fun to do a grand shopping expedition with everyone. Merry Anne and I used to shop together back in the day and Lori was the first one to introduce me to placing my purse in the “shopping position.” We had too much fun at “The Boutique” in Alliance. Miss those days.